The first in this new series of blog posts comes to you live from The Free Trade Inn, Newcastle upon Tyne. Manchester's Cloudwater Brew Co, very much a new kid on the block in the skilled art of pallet assembly, sent this effort up to the north east in advance of their much anticipated Double IPA launch this coming Saturday. We're not sure which route it took but suspect it might've travelled east along the M62 before taking the A1 northbound. Its assembly, to the layman at least, appears to be tight. 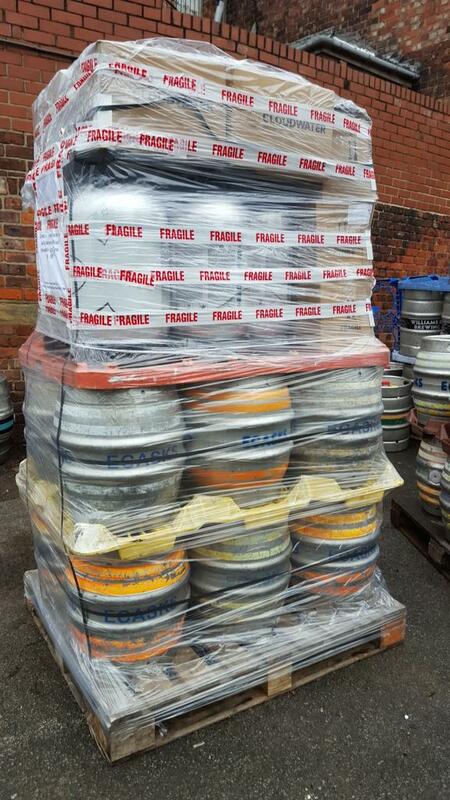 A tricky mix of e-casks, slimline key kegs and boxes has been handled well with the choice of a standard pallet proving a wise one. The pallet is strapped, wrapped and clearly marked. Pallet building expert Denis Johnstone (Brewery Manager, Buxton Brewery) was called in to cast his critical eye over proceedings. After an amount of chin scratching and sucking of air through teeth, he surmised: "decent skills, let down by clear stretch wrap and not banding both ways. 7/10"
A solid score, it must be said. Can anyone score better? Will Cloudwater take this feedback on board and up their game? Stay tuned to find out! Thanks. You must've seen some shockers, Zak?